Monday afternoon, the sports news cycle included news of several underclassmen declaring for the NFL Draft. Chief among them was Kyler Murray who is in the process of deciding whether to pursue football or baseball, or perhaps both. What does all of that have to do with the National Women’s Soccer League? Nothing, really, but it is striking that the NFL Draft does not take place for another three months. When the NWSL conducted its draft last Thursday, it began at noon EST, only 20 hours after the deadline to register for the draft. 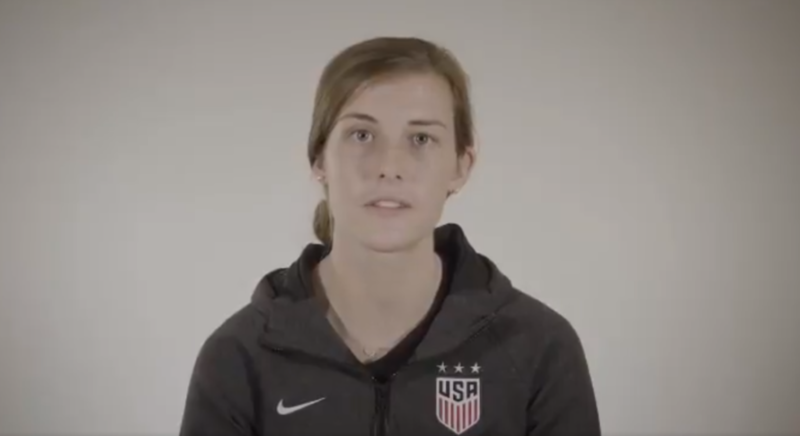 And because the star of the show, Tierna Davidson, literally waited until the last day to register, Wednesday was spent waiting for the answer to the will-she-or-won’t-she question. Even when the deadline passed, it took the league about four hours to let us know whether Davidson was in or out. (The process for updating the site is tedious, I have been led to believe, but there was no tweet either, nor any other alert specific to Davidson.) The Equalizer was able to break Davidson’s declaration for the draft a little more than an hour before the official announcement, but the entire draft process would be better for everyone if the deadline to sign up was about a week earlier. Once Davidson was on the board, it was “a no-brainer” to make her the No. 1 pick according to Chicago Red Stars head coach Rory Dames. 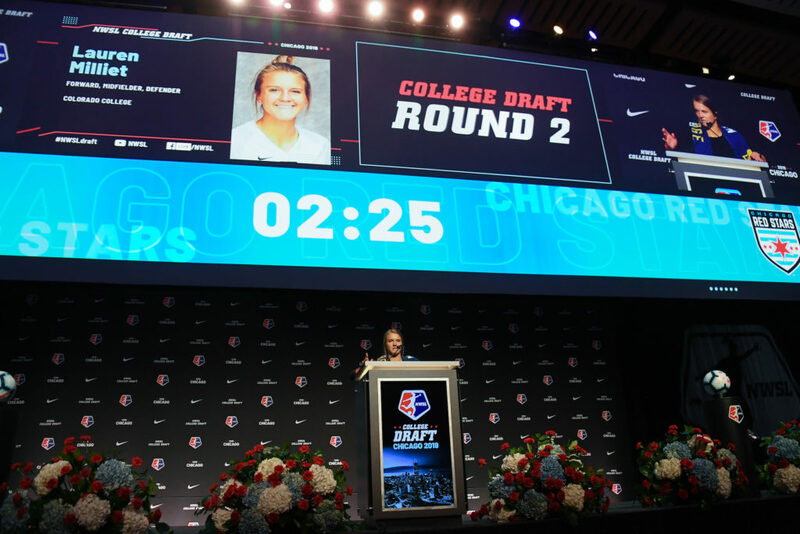 There was nothing “no-brainer” about the draft after Davidson, who was in France with the United States national team but sent a video message which ended with her saying that Chicago is “my kind of town,” something that thrilled locals. The question that loomed over the rest of the opening round was whether Piscataway, New Jersey, would be anybody’s kind of town. Sky Blue FC woke up holding the 2nd and 3rd picks, but there was rampant speculation that top players did not want to be drafted there after the club was exposed for poor living and working conditions last summer. Sky Blue used the No. 2 pick on Hailie Mace. The UCLA defender with three senior caps for the U.S. had turned down an offer from the NWSL to be flown to Chicago to attend the draft. 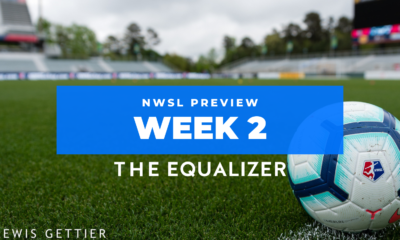 Within hours of her being selected, The Equalizer learned that she was not intending to play in New Jersey. At the same time Mace was picked, a trade was announced. Sky Blue shipped the No. 3 pick to the Washington Spirit for defenders Estelle Johnson and Caprice Dydasco plus goalkeeper DiDi Haracic. The thought was that Sky Blue had been made aware that Julia Ashley was also going to pass on playing for the embattled club, so they decided to trade the pick rather than take someone different. But when the Spirit surprised everyone by using the pick on Jordan DiBiasi and then the No. 4 pick on Sam Staab, things began to get interesting again. The North Carolina Courage had the No. 5 pick and took Leah Pruitt. 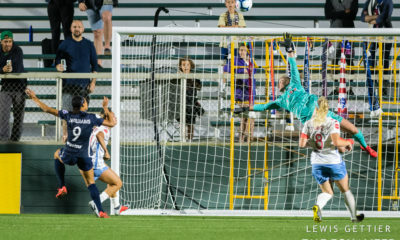 The night before the draft, Sky Blue sent Katie Johnson to the Red Stars for two picks including the No. 6 slot. Ashley was still on the board. Sky Blue pulled the trigger and a stone-faced Ashley went to the podium with the scarf dutifully draped around her neck. After sharing her thank yous with the room and stopping for a chat with roaming reporter Jordan Angeli, she retreated to the media area to be photographed and interviewed. General manager Tony Novo expressed confidence that both Mace and Ashley would be wearing Sky Blue uniforms come March. “There’s challenges with her,” Novo said of Mace. “But I think that she will be here once we talk to her and get by some of the negativity we’ve had in the past. There’s a lot of things that we need to improve.” The GM also expressed confidence he would be able to sign Ashley. Novo promised the assembled press that Sky Blue would have some good news to crow about in the next 30 days. But that could be too late to flip the perception of the club from players in and out of the league. And it could be too late for Mace, who has already signed with Melbourne City. The Australian season ends in a few weeks, but heading there is a sign that Mace means business. She could head to Sweden or England once Melbourne City’s season ends. Amanda Duffy, who is due to be named NWSL President this week, was asked about the Sky Blue situation and offered what was, at best, vague workaround that made it look as if she has no answer. “I think the entire league feels pressure to build and work on what they’re doing at the local level,” Duffy said in response to a question specifically about Sky Blue. “Some organizations may feel that a little more publicly and a little more visibly and last year Sky Blue felt that. We’re working with their ownership and have been for sometime on the steps that need to be taken for that organization to show progress in the areas the league believes it should show progress. If you’re confused, let me remind you that the answer above was to a question about whether it concerns the league that so many players are trying to get out of, or never be a part of, one particular club, Sky Blue FC. Keep in mind that a year ago at the draft, Duffy said the Boston Breakers were operating “business as usual,” even though the previous night had seen the deal to sell them fall apart. The Breakers had been part of the trade talks involving Christen Press, but the instability of the club left them unable to do anything on draft day other than make their selections. By the end of the month, the Breakers were dead. Sky Blue are not dead, as evidenced by their two trades (after the draft they traded Shea Groom to Seattle for Nahomi Kawasumi). They have also made new hires in the communications department, and their owners are financially committed, even if quiet. But along with their top two picks not wanting to be there, Christina Gibbons recently announced her retirement, and Rebekah Stott and Amanda Frisbie have bolted for Europe. Johnson was about to do the same until the trade to Chicago. Several other players have requested trades. It was the draft-day angle and story that refused to go away. However, Estelle Johnson’s Instagram farewell to the Spirit indicated that she was heading to New Jersey and Kawasumi’s goodbye to the Reign said flat out: “I will play for Sky Blue in 2019.” Carli Lloyd has been quiet but her commitment to Sky Blue through 2020 has been consistent. The rest of the 2019 draft trudged along without much in the way of newsworthy activity. 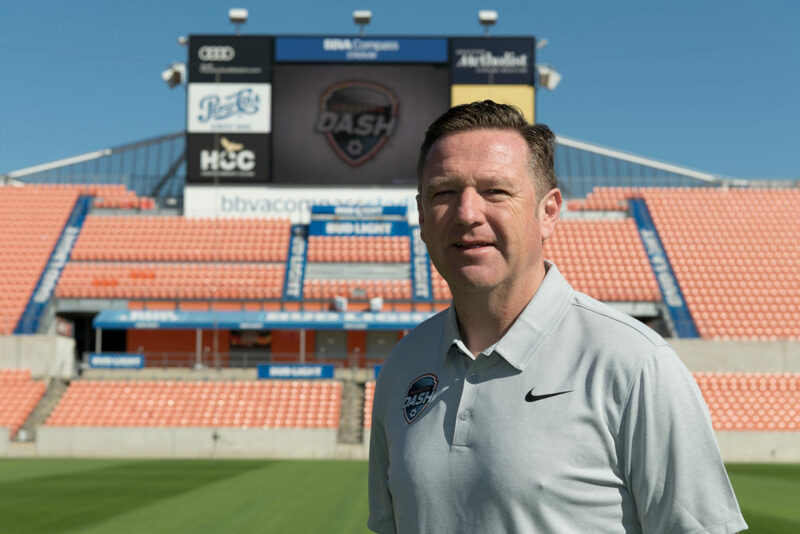 New Dash head coach James Clarkson said he was pleased that so many of the players he identified were still on the board by the time his four second-round picks came up. He also fielded offers for Sofia Huerta, decided none were good enough, and did not pull the trigger on a deal. Other coaches said the players they wanted in the later rounds were pleasant surprises when they were available. New Orlando Pride general manager Erik Ustruck said his new draftees had already started a group text string, and added that new coach Mark Skinner (who he would not mention by name, but who has since been announced) was “100 percent” in on the draft day decisions. 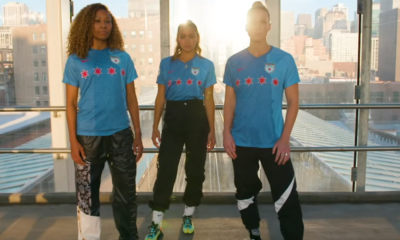 And the Chicago Red Stars, who made the first pick and traded their other two first-rounders, left the day in excellent shape as usual. As we peek ahead to 2020, the Red Stars are sitting on four first-round picks, having their own plus the Dash, Royals, and Spirit’s. – Also, if the NWSL flew certain players in for the draft, why did it take them until the night before to let anyone know about it? – In acquiring Johnson and Dydasco, Sky Blue may have the left side of their defense set, but it seems a small return for the No. 3 pick, especially in a year when coaches were privately lamenting how much other teams wanted for their picks. That said, two starting players for one pick could come in handy for a team that is not only struggling to field a roster but that finished 1-17-6 in 2018. Haracic is a fine story of stick-to-itiveness for hanging around long enough to become a contract player but she is no better than a backup. Her only NWSL win came at Yurcak Field. – A few things were brought to my attention regarding my wish list column from two weeks ago. One is that most major sports league’s websites do not include an easy list of champions or award winners and so it may have been unfair to call out the NWSL site for not having it. The editorial content is also fully inclusive of the entire six-year history of the league. However, the need to have the 2013-2015 statistics included on player pages, schedules, and other elements remains and should be figured out sooner than later. Secondly, I called on NWSL teams to be more transparent about their hiring process for head-coaching vacancies. I stand by that, but a good point was made to me that is worth repeating. 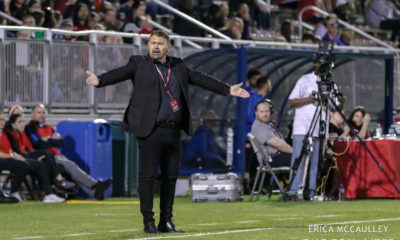 Unlike many other sports leagues when almost all candidates are internal in terms of the league infrastructure, many NWSL coaching candidates have outside jobs and it may not be in their best interest to have their candidacies go public. Still, there needs to be some sort of happy medium. Thank you to those who brought these points to my attention. – Speaking on coaching hires, Amanda Duffy said there are rules in place about identifying minority candidates for certain positions. She declined to expand and said no team has ever been in breech of this policy. Look for more about this on the site in the coming days. – I’m not sure how Amanda Duffy being president will be different from Jeff Plush as commissioner. And I’m lukewarm about the last 22 months in which Duffy has been essentially the acting commissioner. But I’m curious to see what she will do with a little autonomy. One of the first things up is hiring a brand manager who will replace the outgoing communications director, and ultimately hire someone else to handle the media requests and other similar tasks. This will be a key hire in shaping the next few years of NWSL and its public perception. – Podcast Row was lots of fun. It is always good to conduct casual interviews face-to-face. Thank you to Laura Harvey, Monica Gonzalez, Haley Carter, Ali Krieger, Yael Averbuch, Alexi Lalas, Leslie Gallimore and Dave Copeland-Smith for stopping by. And keep an eye (ear?) out for these interviews soon. – Seattle Reign coach Vlatko Andonovski tried to get into the draft. He really did. But it was not to be, and the Reign joined the 2015 Portland Thorns as teams not to make a pick at a draft. The Reign will hope for better results. In six years, the only time the Thorns have sat out the playoffs was 2015. – The convention is always a great time, but it wasn’t quite the same without Jim Gabarra.